The drubbing Modi and, secondarily, the ruling BJP, was given by the Indian voter in Madhya Pradesh, Rajasthan and Chattisgarh is a testament to his remarkable good sense and equanimity. The surging frustration with Modi, in particular, found expression in even relatively good chief ministers — Shivraj Singh in MP and Raman Singh in C’garh, with much to show by ways of good governance, being trounced. It has less to do with seeing the same old faces seeking an extension of stay in office, than with the people firing a warning shot across the bow of the BJP ship Captains Modi, Amit Shah are steering, and which long ago lost direction and sense of positive purpose. Let us succinctly jot down the main points and refer to some lessons prime minister Narendra Modi should learn unless he craves an early political vanvas in 2019. There was no clearer message by the people than that they didn’t care for the Modi at the centre who is helming a growingly illiberal Indian state where the cow is venerated, huge gobs of public monies invested in gau-shalas, and what people can or cannot eat, drink and wear is dictated by a straitjacketed version of Hinduism foreign to the vedas. That the youth have had it with the absence of mass employment programmes that is sought to be covered up by talk of digitisation of governance, etc. They want the Modi of 2014 to emerge from the quagmire, but if he does, he will carry far less conviction, and his talk of re-working the government to make it more accountable and less intrusive in the lives of ordinary Indians, more readily dismissed as so much gas! And armed with evidence of five years, his emphasizing of ‘Make in India’ that involves little more than, as I keep repeating, screwdrivering imported equipment, and otherwise turbocharging a genuinely indigenous defence industry, will be readily refuted. In fact, he may well be accused of under-estimating the capability of the private sector that can, given its head, produce the most advanced technology. The issue is these are all things he actually promised in the 2014 Campaign, but did little to realize. The question to ponder is will the Prime Minister pay heed and make a drastic course correction? Probably no. And even if he were to do so, where’s the time to show results? Hence the possibility that come next year’s general election the country will be staring down the barrel of a populist-wasteful, non-performing, coalition government that will retard India’s progress, leaving many of us ruing how Modi, armed with the people’s sanction to restructure government and set the country on a radically new, more productive course, fouled up. Amit Shah, the BJP supremo and PM’s chief lieutenant, has proved he is no Chanakya of domestic politics (any more than Ajit Doval — Modi’s adviser on everything related to the working of government and the military — God forbid!, is Chanakya in the external realm), and that, if persisted with, his brand of political strategizing keyed to relentlessly low politics will only dig a still deeper hole for Modi to slip into next year. Talk of Modi’s bad political instincts. He installed people he thought were like himself — pracharak of the RSS or Gorakhnath mutt type — Manoharlal Khattar, who made as big a god almighty mess in Haryana, as Adityanath has done in Uttar Pradesh, except neither of them had his political nous and resembled bulls flailing around in deep water and stirring trouble BJP could have done without. 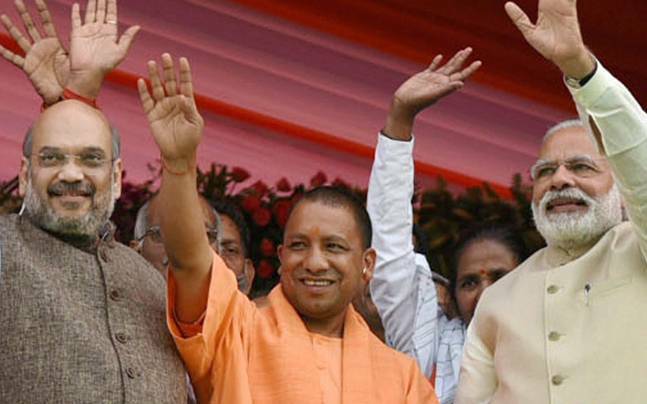 Whether Modi now appreciates the limits of the Hindu hardline and how it demotivated even party devotees in urban areas (the small trader class already hurt by GST and demonetisation) where Shah, for some unfathomable reason, had deployed the blundering Adityanath, may not be known. But it would be politically reckless of Modi to not recognize that Khattar, Yogi and their ilk are political poison and will sink BJP’s residual chances in 2019. And by extension that the Hindu fringe groups like the Bajrang Dalis the Yogi patronises may get out the vote in the countryside and elsewhere alright, but against the BJP! It doesn’t speak well for Modi and Shah’s supposed mastery of Indian politics and its slipstreams. Rahul Gandhi, contrary to his reputation, has proved himself fast on the uptake. He revealed that the 2014 election was a great classroom. He didn’t do this in his post-election results press conference, but he may as well have thanked Modi for being such an adept tutor, and how all his temple-going and corruption charge hurling learned from Modi, fetched him results. Modi, Shah and that lot will hereon find it hard to trump Rahul on these and similar poll practices. And, finally, Modi’s hubris — “excessive pride and self confidence” as the word is described, led him to believe that no one could better him, that he was lord of the Indian political scene he surveyed, and that a second term in office was his for the taking. The Gods have a way of mocking such pretensions, and not just in hoary Greek tragedies, as the public did in this case. Modi’s promises of fast-tracked development and gigantic jobs generating schemes persuaded lots of people, especially the young demographic. Five years later they will hear the same rhetoric this time from Rahul. The point is not that the Gandhi scion will be any more persuasive, but that widespread disillusionment with Modi will take its toll. It may not return him to Vadgaon, but will get him to Parliament (if he ensures a safe seat in Gujarat), perhaps, not as Prime Minister. This entry was posted in civil-military relations, corruption, Culture, Cyber & Space, Decision-making, Defence Industry, domestic politics, Indian Air Force, Indian ecobomic situation, Indian Politics, Intelligence, Internal Security, SAARC, society, South Asia. Bookmark the permalink. True. But given RaGa’s ultra liberal instincts (friendship with the likes of the late Praful Bidwai) and the general aversion of the “first family” towards nuclear deterrence, what would become of the further development of our deterrent under a RaGa led government ? Any possibility of our undergoing nuclear disarmament of some kind- either through a direct political decision or by starving it of necessary further development? Given RaGa’s many mysterious travels to foreign lands, this is a misgiving that cannot be dismissed. Your comments ? Not sure Rahul G will get in, in 2019, or any time soon — Mayawati and her BSP will see to it. In the distant future, who knows. The Indian N-arsenal is less powerful than it is made out to be by its past and present minders but it is beyond the capacity of any government to push it into reverse gear as disarmament would require. Immediately pushing it into reverse gear is not feasible. But they can starve the deterrent of funding, and drastically slow down testing of IRBMs (after all, only this year the A5 was tested thrice within a year) and so on. This neglect could bring things to a point where the deterrent could be sold as being pointless (like in the Brahmin and thieves story of the Panchatantra). As for RaGa not getting in, 140 seats is enough for that disaster to happen. The SP/BSP etc can only dance to RaGa and Co.’s tunes, as they did for SoGa during the UPA years. RaGa getting in is a possibility with quite a good probability. What happens then ? Would funds for deploying A5 and other such missiles get choked? Ghotala by unelected and UNELECTABLE mmsingh the American dalal. देखो👇👇👇👇 कितने घोटाले किये हो?? Nothing to do with Sonia/ Rahul. Sonia was forced. The American agent mmsingh was and is UNELECTABLE and Sonia Gandhi was forced by American pressure to give PM post to that UNELECTABLE man who is leader of no body let alone Congress party.in this plot BJP was involved as well . There is nothing much to be read into the meetings of Mr. Gandhi, Ms. Gandhi-Vadra and Ms. Gandhi, . “op and 2008 elections he did not even dare do electioneering Fter two flop meetings with less than 100 peoples, crowd. When the unelected and UNELECTABLE man like mmsingh the American dalal was imposed then you lot did not feel ashamed that a sitting Pm could not even get elected as MP and had to lie about his Assam residency to get into rajya sabha ? Limiting Indian missile range to 2500 miles at American request. Harming India’s energy security by getting out of Iran India gas pipe to US demanded. Unelected ex pm mmsingh -the dalal of America forced air India to buy 65 Boeing’s at one go _ it is that which bankrupted air India . All to help USA ! Topical even today 15 years later. Manmohan singh — there must be no role or minimum role for parasite looser-an IMF FUNCTIONARY – manmohan singh-a western stooge.- he is no leader-he can not get even two persons elected . this is exactly opposite what people voted for–they voted for definite change in economic policy and nto the type for which manmohan singh is liekd by foreing isnipred english media. With atal bihari vajpayee winning our India would have been enslaved fully by the angloamericans within 12 years-: now with man mohan singh india will have been enslaved within 10 years. look at the happiness of american and british in having sonia gandhi removed -she could have saved india from their clutches-all is lost for india now. why are the left delaying in joining govert.does the left not know that right are waiting as vultures? the LEft is a looser party -the right would have jumped at the chance to influence the govt. even when mandate from people is for going left; but look at these looser left -they decided not to join! !